Dark Horse Comics is excited to feature all-ages stories from Nickelodeon’s The Legend of Korra and Nintendo’s ARMS for our Free Comic Book Day Silver offering on May 5, 2018! First, Avatar Korra pairs up with an unlikely sidekick for a super-important, top-secret mission to track down a pack of lost pets in a story written by The Legend of Korra co-creator Michael Dante DiMartino with art by Jayd Aït-Kaci and Vivian Ng. In a story based on Nintendo’s exclusive fighting game ARMS, a young fighter trains tirelessly to reach the top in the ARMS League Grand Prix—but first, he must defeat 599 other contenders! 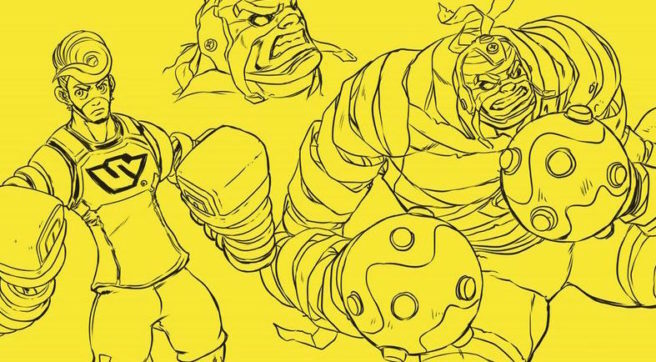 ARMS is written by Ian Flynn (Sonic the Hedgehog, Mega Man) with art by Joe Ng (Street Fighter, Overwatch: Binary). And to wrap things up, our FCBD all-ages issue features an equally beautiful and fun The Legend of Korra cover by Jayd Aït-Kaci and Vivian Ng! Free Comic Book Day is a single day when participating comic book specialty shops across North America and around the world give away comic books absolutely free to anyone who comes into their shops. Visit FreeComicBookDay.com to learn more!